In my book of travels, Zimbabwe exists in an elite group of countries-that-are-ridiculous. Since its hyperinflation made U.S. news back in 2008, Zimbabwe has piqued my curiosity. Just a few years ago, Zimbabwe was in shambles. Unofficial figures put annual inflation at 516 quintillion per cent and prices were doubling every 1.3 days. A Z$100 trillion banknote was printed just before the country abandoned their own currency for the U.S. Dollar and South African Rand. I had a wild nine days in and around Harare, the country’s capital. Below are some of my more memorable experiences. It was 12:15am, and I had almost given up. Etson, a taxi driver I had employed earlier in the day, was supposed to call me. We had planned to get drinks when work calmed down, around ten. Past midnight found me curled up, reading Blindness, my eyes heavy and weary, perfectly poised for a night of deep sleep. The phone rang. ALAN! This is Etson. Yes, Etson. I am ready. I am coming to pick you up. Ten minutes. Ten minutes. Oh, great. You can say that again! We drive to Tipperary’s, a nightclub just outside the city center. Etson informs me that due to a special event, entry was $3, each ticket good for two beers at the bar. We navigated the crowd and walked through an outdoor patio. Inside, the bar was pulsating. African music, hard and hypnotic in one room, a billiards area in the center, jam-packed with scantily-clad prostitutes, the clinking of beer bottles and shuffling of feet around the pool table. Etson and I found another room, in the back with a bar, and sat down, attracting a small crowd. Sporadic drunken approaches by a journalist for The Herald (a local paper) interrupted our conversation. Etson received a call from the hotel to return and pick up a client. My guess is that the hotel didn’t know he was drinking with me at the bar. On the short drive home, Etson turns the other way, onto Chinamano Road. Now it’s vampire time. Let’s go look for vampires. The road was dark, quiet, full of shadows, tree branches slenderly draped toward the dirt, a thin layer of dust in the air. It took me a few seconds to figure it out. When I did, I asked Etson how much a “vampire” might cost. “$15 for short-term, $60 long-term. Oh! That one is waving, look!” I politely waved back, of course, asking Etson to drive away, back to the hotel. He was slow to the pedal. I glanced back and saw three girls, running toward the car, left behind in a late-night heap of dust. Rather than a trip to Victoria Falls, which would certainly have exhausted what little recreational money I had allotted for this survey, I opted for a Harare city tour. Below are a few pictures. 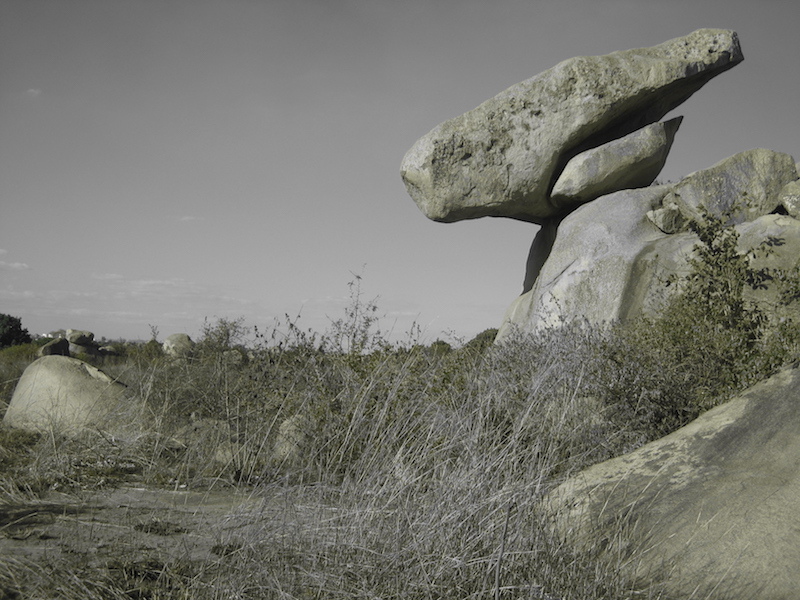 Kopje, a large granite hill just south of central Harare. There is a monument there that was built in 1936. It’s a great place to scout out downtown Harare. The Chiremba Balancing Rocks, a field of precariously balanced rocks, some with art from the Zimbabwe bushmen of the early 20th century. 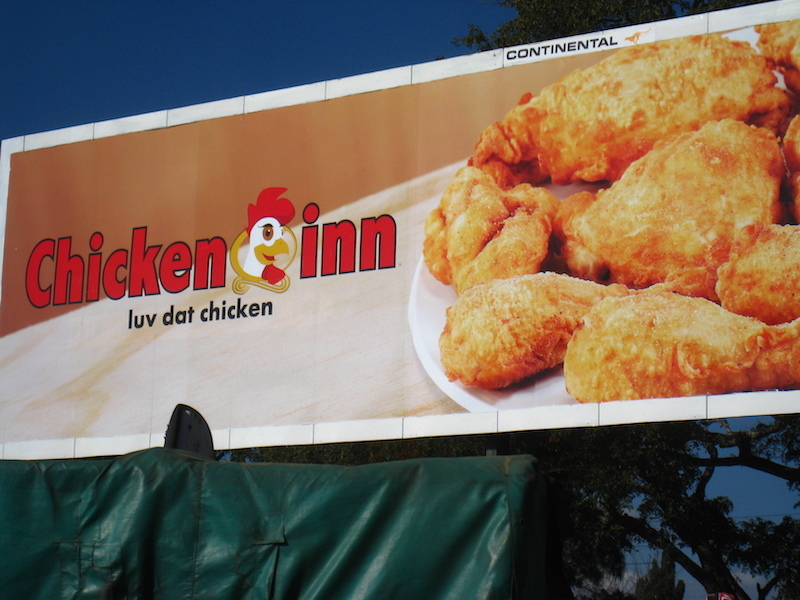 Luv dat chicken! Of all my options, this is where I decided to stop for food. This billboard reeled me right in. At the Zimbabwe Museum of Human Sciences, images were not allowed, so I snapped this one from outside. Inside, I saw stuffed vervet and samango monkeys, a black rhinoceros skeleton, a Vulcanodon dinosaur foot and a replication of an indigenous Shona village. The museum itself was dilapidated, dark and grimy, but from what I was told it was the only museum in the city. There was an interesting exhibit on the Zimbabwe Olympic Committee, which began sending athletes to the Olympics in 1980, thirteen who were represented in the 2008 Beijing Games. The Botanic Garden, at sixty eight hectares, has over nine hundred species of shrubs and wild trees from all over the country. Today, farming and land ownership are two huge issues in Zimbabwe. Robert Mugabe, disturbed by the imbalance of land ownership–in the 20th century, whites made up less than 1% of Zimbabwe’s population but held about 70% of the most arable land–initiated a land reform program that, in the eyes of many turned the country upside down. Beginning in 2000, Mugabe “redistributed” farmland, kicking some 4ooo-odd white farmers off their land. The country used to thrive agriculturally, exporting crops like tobacco and maize, but now with suboptimal management and a lack of proper knowledge, Zimbabwe imports more and more. It’s a sad story. I heard this history firsthand, from a guy named Mark, a family member of a college friend. Mark and his wife, local Zimbabweans, were kind enough to let me into their home, feed me, introduce me to their friends and children and enlighten me on what life in Zimbabwe has been like for farmers over the last several years. We also snuck in a little golf. Back in the mid-90s, Mark was kicked off of his farm in rural Zimbabwe. The chief of police, a friend of Mark’s, showed up to the farm one day and asked him to leave. Since they were friends, the police chief gave Mark’s family time to pack their things. There weren’t any guns involved, but many other farmers were not as fortunate. I visited Mark’s new farm, where he raises chickens, 15,000 at a time, five times a year. He also grows passion fruit and has entertained the idea of raising crocodiles from Mozambique. He purposefully keeps the farm disheveled, in an effort to thwart any government employee in the market for redistribution. I could go on and on. Zimbabwe was a wild experience, definitely a place that I’ll be keeping tabs on. Who knows what will happen with new leadership–Mugabe is going on 90. I saw so much potential during my visit. With agriculture, with tourism, with all kinds of business. Given the right direction, Zimbabwe could turn itself around. It’s such a beautiful country. The scary thing about hyperinflation is that America and the UK are at just as much risk of it. Time will tell on that one. I don’t know what us blog readers would do if we didn’t have your adventures to read. On another note, do you think it would be an overly expensive destination to backpack around (at least today)? @Jonny: Yep, you’re absolutely right. We all like to think the American economy is sheltered from something like that, but given the last couple of years, anything is possible. @Earl: Interesting question. I think a backpacking trip through Zambia, Zimbabwe, Mozambique, etc. is certainly feasible for the budget traveler. I saw a few hostels and didn’t spend much on food and entertainment. So much to do too. Luanda, on the other hand…yikes. The most expensive city in the world! Such a great article man. The fact that they actually printed a one hundred trillion dollar bill is just bizarre. Reading this really got my attention because I have never really considered putting Zimbabwe on my list of countries I’d like to visit. It just might be on there now. It seems like a place with a ton of potential and some experiences that not a ton of travelers get to experience. @Nate: Bizarre indeed. I tried to get my hands on one, but had to settle for a fifty billion dollar note. Or was it five hundred? Too many zeros to keep track. You should definitely consider sub-Saharan Africa. Lots of cheap safaris (most people head to Kenya/Tanzania where it’s wicked expensive). I’d say Harare and Windhoek have been my two favorite cities this trip. Lots to offer for visitors. I would love to visit the place as well. I only heard of Zimbabwe in books, I’m glad that you shared your experience in the place. And I can’t help it, the chicken looks very delicious! Nahhhhh.. What happened after those vampires went to the car? Tell me!!! eheheh.. It’s actually a very good narration. It hooked me to the article but I want to know the entire story. I hate to end up guessing. Pssht. Nothing, Daniela! Not much of an end to the story. Cruised around, went to a bar with my driver and had a few drinks, then he dropped me off at the hotel.